We all have dreams of getting fit, having more time and trying new ideas but do we ever get anywhere near to achieving our goals? I regularly write about my goals but I feel that I want to give my goal setting more structure. The Welcome to Now Project is a self-improvement project I've set myself (you can follow my progress or join me at any stage). It's all about taking action today by making small changes to make future dreams a reality. I'm creating a straightforward and user-friendly approach to finding new motivation and achieving quick results by working on 4 areas for 4 weeks. The Welcome to Now Project is a personal experiment and challenge but by writing about it I will be accountable to you and hopefully find new motivation to keep going. I might also inspire you to join in. Initially, I'm going to try this project for just 4 weeks (starting today and ending on June 15th). I'll be updating you regularly and evaluating the project at the end. Who knows where it'll lead? My goal is to live a simpler life unclouded by distractions, confusion and clutter (both mental and physical), to be healthier and to spend time doing the things I really want to do. I guess that pretty much sums up my approach to minimalism. Through the experience of downsizing my home, changing job and re-evaluating my values I have improved my life considerably over the past 5 years. I've developed confidence to take risks and make changes that I would never have thought possible a few years ago. But I still have residual clutter that I feel is holding me back and unfulfilled dreams that never seem to get off the ground. Why 'Welcome to Now'? Because I believe we have to accept and love ourselves as we are today. There's no point in looking back at past failures or wishing for a mythical future when we'll be stronger, have more time and more motivation to change our lives. That's never going to happen. The best time to start is now. Every week we have just 168 hours at our disposal including sleep! We need to choose how to spend that time wisely. The Welcome to Now Project is a mindset, an affirmation and a way of giving some oomph to those brilliant ideas that you already have deep in your heart but you're just too frightened to try. 1. The-once-and-for-all-declutter. Clearing clutter creates a calmer home and mind. By removing the excess from our lives we can be more open to new direction and ready to explore new horizons. We can be bolder and braver in life, think more clearly and really move onwards with our plans. I regularly declutter but I still have a long decluttering to-do list which I'm never going to break the back of unless I take serious action and make time for a huge purge. Now is the time to declutter. 2. Be Fabulous. Enjoy exercise, sit still for less, make healthier food choices and try meditation. Maybe have a style refresh. Find pleasure in everyday things and be a glass half-full type of person. It's all about attitude. 3. Find Focus. Learn to set limits on online time, prioritise tasks and take baby steps towards new projects. 4. Try Something New. It's time to try new things, read something inspiring, learn a new skill and and have some fun. Each week I'll reveal my plans for each area. Alongside this I'll be writing about time management, mindfulness, nutrition and anything else that is a useful tool in moving forward. 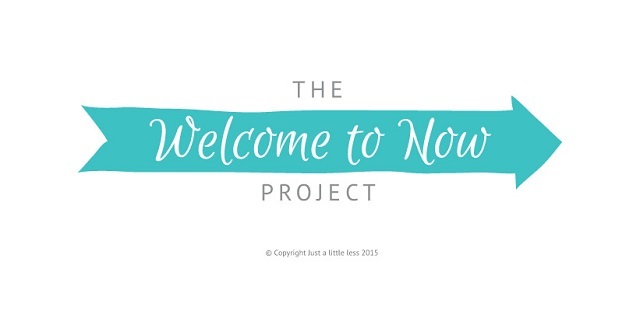 Please feel free to join me with The Welcome to Now Project. You could choose to join me on all 4 areas or just pick 1 or 2. I believe any changes I make will have a positive impact on my life and will take me forward. I'll share my successes as well as my failures. You might have your own ideas to work on in each of these areas – I'd love to hear about them. If you have any ideas or questions about this project please let me know so I can be of more help to you. Fast forward 4 weeks. How do you want to feel? How do you want to look? What do you want to be proud of? Do you want to be the best you you've ever been? Is it finally time to let go and start living your dream? The Welcome to Now Project has begun! Gosh this sounds exciting and very do-able. I'm looking forward to following your progress and perhaps joining in. The decluttering is very dear to my heart at the moment, as I am plowing through the cupboards and 'hidden' spaces to clear the clutter there. Even knowing it's there behind closed doors is enough to keep me 'on edge'. It's all going to be car booted next month, we did one yesterday and started the ball rolling, now there's room to fill the now emptied boxes with more 'stuff' ready for turning it into cash next month. Since finding your blog I have been motivated to do a lot of decluttering to the point where my wardrobe only contains now things I like and wear and all those things that I felt guilty letting go of (because they cost money) are gone to another good home! Even hubby, who has lost loads of weight on his own personal journey has handed in two suits that were too big - difficult for him as he is a terrible hoarder. I will look forward to following your progress and hope that all of us who do so will leave comments to encourage you - good luck and thank you for sharing your ambitions and inspiring others. So glad to hear that I am not the only procrastinator around....love the idea Claire, dare I say I will join in ....knowing me I will put it off...but I will certainly give it a go. Wonderful idea Claire and I'd like to join the project! I love what you wrote about accepting and loving ourselves where we are now. I am recovering from a stress related illness, after several years of particularly stressful parenting of chronically ill children (who are now fine btw! It was worth it! ), but i can no longer do as much as I used to, or everything I want to do because I simply get too tired! While a challenge, it has been brilliant for helping me declutter my life and commitments and focus on what is important to me. I will be participating along with you! Definitely joining the ranks of the after-dinner walkers around here now the weather is cooperating (we have a lot of Mediterranean-origin workers where I live! )… the dog will love me for it!